For the past three years, we have been partnering with a number of organizations – IEEE, Open Mobile Alliance and Agile-IoT – to get a sense of the general trends in the IoT industry through an online survey. The fourth edition of this survey ends on March 5th, and I am hoping that many of you who haven’t already will be participating – it litteraly takes just 5 minutes to answer. Whether you are actually a developer, or simply involved in building IoT solutions one way or the other, your input will be key to understanding what kind of IoT solutions people are building today, and more importantly how they are doing it. 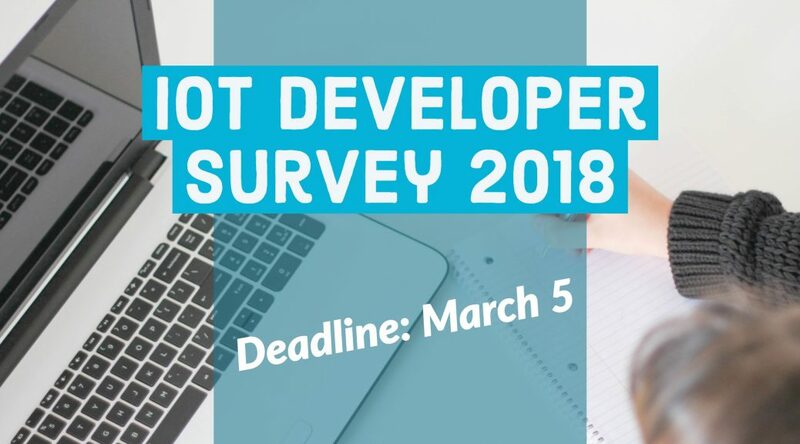 The results from last year, for example, provided interesting feedback on the rising interest in Industrial IoT, who people see as IoT corporate leaders, or what are the programming languages and frameworks typically used by developers. Please don’t wait and take the survey now! Previous PostEclipse IoT Day is coming to the Bay Area – Submit a talk now!Next PostOpen IoT Challenge: What Have the Participants Been up To?